Are you worrying too much? Sept 4, 2017 - Are you worrying too much? Are you finding yourself to be more irritable than normal and having a difficult time shaking it off? Are more things distracting you and are little things getting to you to the point that you are becoming irritated even with yourself? Chances are there are some underlying things you are worrying about that are the culprits contributing to your mood. What are they, and why are you worrying about them? The problem with worry is that it serves no valuable purpose except to distract and take your focus away from what will help make the worry go away. Take an MM&I Moment to write down all the things that are bothering you right now, no matter how small. What are you worrying won't turn out as you had hoped? What are you worrying won't happen that you want to happen? Get all these things down on paper, and then remember the power of CAN DO, which means Conscientious Action Nurtures Desired Outcomes. Next to each item that represents your worry, write what you CAN DO to keep things moving in the direction that you desire. Write down what you CAN DO to make other exciting or positive things happen so you will stop worrying and simply start doing. Then put your CAN DO into motion, because once your do, you will be amazed at how your worries will melt away. Want to receive Sherré's weekly Wide Awake Wednesday emails? Sign up now to get inspired, get motivated, and get things done! 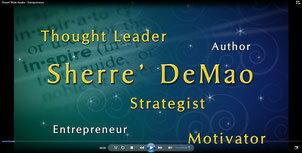 “I have seen Sherré DeMao speak numerous times, and she always exceeds expectations with high energy, fresh thinking and actionable insights. Her Profitability program is a perfect example of her ability to look inside businesses and see what they cannot see, and then constructively help them manage and grow their businesses in powerful ways. Her numerous examples from companies from around the country prove that whatever Sherre’ recommends is working for others." "Sherré's words of inspiration and real-life scenarios were just what these professionals could use and relate to no matter which direction that their career was taking them. Her comments were so relevant and poignant that it still resonates with me nearly a year later. Sherré was a favorite with her address. I look forward to the opportunity to work with her again."